If you’re serious about making fantastic homemade ice cream & gelato, then you’ve probably heard of Lello with it’s Italian-made ice-cream and gelato makers. Lello brand ice cream makers are among the best. They’re top of the line, powerful machines that make delicious, parlor-style frozen desserts. But which Lello should you get? Let’s take a look at both the Lello Musso Pola 5030 and the Lello 4080 Musso Lussino and see if we can make that decision between the two machines a little easier. First off, Why a Lello? When we think of great gelato, we think of Italy. Italians know how to make great gelato…and they know how to make the best gelato and ice-cream makers. Both the Lello 5030 and the Lello 4080 make smooth, creamy gelato, ice cream, sorbet, and frozen yogurt. It’s all in the expertise & construction. The Lello boasts a strong motor that’s built to last, all stainless steel construction, and more than adequate refrigeration. All this works together freeze the ice cream surprisingly fast, churning along the way, resulting in very small ice crystals. Small ice crystals mean smooth, creamy, decadent ice cream. Most ice cream makers have removable aluminum bowls. Everything is stainless steel: the housing, the bowl, the blade. Since the bowl is carved into the top of the machine, there is no gap letting cold air escape. This means your ice cream will freeze better and faster, creating smaller ice crystals and a smoother taste. The Lello machines are very similar in quality of construction, durability, and, of course, making great ice cream! How long till the ice cream is ready? You can see from the pictures that the Lello Musso Pola 5030 is rectangular, while the 4080 Musso Lussino is oblong or oval shaped. Measures 20 inches wide x 14 inches deep x 12.2 inches high. Since the Musso Pola 5030 weighs 68 pounds, you may want to either keep it in a permanent location, or keep it on a stainless steel wheeled cart for easy access and storage. Measures 12 inches wide x 18 inches deep x 11 inches high. It weighs in at about 38 pounds. Still heavy, but very manageable. This one could fit on a pantry shelf. Capacity is oh-so-important. It can be the difference in a quick dessert enough to feed everyone or waiting for a second batch before every can (politely) start eating. 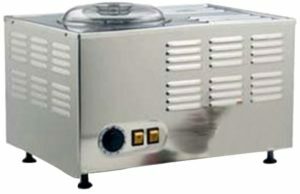 The Musso Pola 5030 has a large 2 quart capacity. The 4080 Musso Lussino is not far behind with a 1.5 quart capacity. Many other gelato/icecream makers have under 1.5 capacity. The Lellos are great in this regard, but the larger 5030 offers a much larger capacity at 2 quarts. There’s 4 cups to one quart, and many ice-cream labels will specify that a serving is 1/2 cup, but most people eat more than 1/2 cup of ice-cream in a single serving. If we bump up the serving to one cup which is more realistic, the Musso 5030 will provide 8 servings per batch. The more compact 4080 will provide about 6 servings. The great thing about the larger capacity of the 5030, is that depending on your group size, you can make a single batch and be done with perhaps a little left over! How Long Till It’s Ready? The Lello Musso Pola 5030 mixes and freezes ice cream or gelato in about 20 minutes. It also has a very high rate of output. That means it can make 3 batches or up to 6 quarts of ice cream, frozen yogurt, or gelato in an hour! 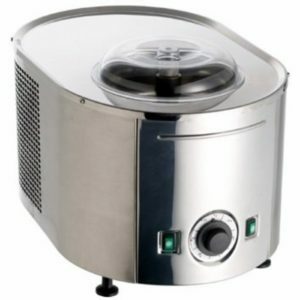 The Lello 4080 Musso Lussino makes frozen desserts in about 30 minutes. Although that’s slightly longer than the 5030, the Muso Lussino can still make 2 batches or up to 3 quarts an hour! And there’s no down time between batches on either machine! Simply remove the ice cream from your first batch, add your next mix, and start it up again. You can make a variety of flavors back to back for the perfect ice cream bar that will please all your guests. Both the Lello 5030 and the Lello 4080 make fabulous ice cream for home use, and the Lello Musso Pola 5030 also pulls its weight in commercial ice cream shops. While the Lello 4080 is almost professional grade, its smaller capacity makes it perfect for homes. The Lello 5030 is a commercial machine, but without the gigantic space requirements that large commercial machines require. With its higher capacity and rate of output, many restaurant and shop owners find it does a fantastic job of keeping up with all those ice cream-loving customers. Most shops make several batches and keep them in the freezer for future use. Since the Lello 5030 is on the smaller end of commercial ice cream makers, many choose to buy it for use at home as well. Consider your space and the size of the machine. You’ll need some counter space for the 5030. The Lello 4080 is smaller to handle and does fine stored on a shelf or in a cupboard. Number of servings for guests. It’s easy to make ice cream ahead and keep it in your freezer, but if you host a large crowd, consider the Lello 5030. These machines are so well-made, that you can’t go wrong with either pick. The price for the Lello 4080 right around $700, while the Lello 5030 costs just under $1,200. Or will it be the High-Capacity 5030? Here’s to happy ice cream making! Cheers!